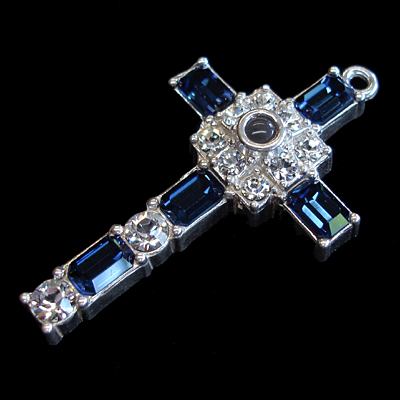 Our sparkling and elegant Grace cross pendant is a timeless design featuring beautiful deeply colored Montana blue octagonal cut and clear round cut Swarovski crystals. The Montana blue crystals are reminiscent of fine sapphires. This 1/4 ounce Solid .925 Sterling Silver setting is accented with our ultra-high resolution stanhope picturelens. The back of the pendant is detailed with the Stanhope Jewelry name circling the lens and is stamped .925 silver. A peep inside the stanhope center reveals the crystal clear image of your choice or to personalize your Grace cross, upload your own favorite photo. You can also add your own custom message or title. You may also select to add a chain in various lengths. Nicely packaged in a gift box and arrives with a gift bag with tag. Made completely in our workshop in the USA. I had been looking for your crosses for years. Our grandmother had had the star and band cross with the Lord's Prayer; my sister and I treasured peeking through the cross to read those precious words when we were children. What wonderful memories we have of that! I stumbled onto your website and could not believe the quality of your products! The toughest part: which cross to select! I specifically selected the Grace Cross Pendant as I wanted a keepsake that would last my lifetime. Rather than selecting the wide range of prayer cross images, I chose to provide a photo of my favorite Bible verse from my own precious Bible. I received my treasured keepsake today and it's even more beautiful than shown! I placed my order on the 11th, received a confirmation phone call on the 12th from Michael verifying the photo I had included, and received my cross on the 14th. 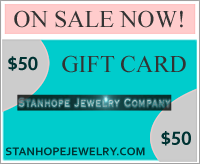 I cannot thank everyone at Stanhope Jewelry enough: keep doing what you do!